Finnair's pending entry to the British Airways-Japan Airlines Europe-Japan joint venture will give a much needed boost to the oneworld-led JV, whose share of the Europe-Japan market will increase from 16% to 23.5%. The JV encompassed European connections from British Airways, but the large point-to-point nature of the London-Tokyo market as well as the backtracking involved at Heathrow provided the JV its strongest hold between Japan and the UK. A similar Star Alliance-led Europe-Japan JV was anchored by All Nippon Airways and Lufthansa, accounting for a quarter of the market. The addition in 2012 of fellow Lufthansa Group carriers Austrian and SWISS has boosted the JV's share 32.5%. Beyond market share, the Star JV was more effective at offering connections around continental Europe. Finnair's addition is also a tidy conclusion to the flirtation between Finnair and JAL, which in Jul-2013 launched its own Tokyo-Helsinki service and wanted to tap into Finnair's geographically convenient hub. The closer ties between Finnair and BA follow Finnair's addition into the trans-Atlantic JV and BA's increasing admiration for Finnair's Asian strategy. There may be more to come from this relationship. Finnair in Jul-2013 announced its intention to join fellow oneworld carriers British Airways and Japan Airlines in their Europe-Japan joint venture, which became effective in Oct-2012. Finnair's addition will boost the oneworld JV's share of the Japan-Europe market in Jul-2013 from 16% to 23.5%, giving it greater weight against a similar Star Europe-Japan JV formed between ANA and Lufthansa and expanded in 2012 to include Lufthansa Group carriers Austrian and SWISS, which collectively has 32.5% of the market, most held by ANA and Lufthansa alone. Despite being a "secondary" addition to the team, Finnair brings to the JV more capacity than that operated by British Airways, which in Jul-2013 flies daily to Tokyo Narita and five times weekly to Tokyo Haneda, both from London Heathrow with 777-200s. Finnair in contrast operates daily from Helsinki to each of Tokyo Narita, Osaka Kansai and Nagoya with A330s/A340s. Finnair's Japanese capacity is approximately double that of BA's. Comparing the capacity sizes of Finnair versus British Airways does not take into account the fact those are different types of capacity. British Airways' capacity has a higher concentration on point-to-point traffic than Finnair's, commensurate with Finnair's strategy to be a network carrier linking Europe with Asia. BA's point-to-point nature gives it higher yields, making its combined presence with JAL between Tokyo and London very attractive. Although European connections were mooted and included in the JV, in practice the JV was really about UK-Japan traffic. Even if the two were to look at connections around Europe, BA's hub in the far western corner of Europe meant considerable backtracking was involved to reach continental Europe. That is not a concern in the Star JV, where European members Austrian, Lufthansa and SWISS have hubs on the continent, facilitating more efficient connections. Finnair's focus on connecting traffic is complementary to the point-to-point focus of BA. Helsinki in fact is the nearest European hub to North Asia. A flight from Tokyo to Helsinki is some 1,200km shorter than into a Star hub in Frankfurt or Vienna. That efficiency helps off-set Finnair's slightly higher operating cost. Helsinki's careful design to be an efficient hub means more effective connections are possible; the airport's minimum connecting time is about 35-40 minutes. Finnair also brings considerable network benefits on the Japanese side. BA and JAL link Europe only to Tokyo's Haneda and Narita airports. In the Star JV in contrast, Lufthansa also flies to Europe from Osaka and Nagoya. Finnair flies to Osaka and Nagoya too, so its addition will open more one-stop city-pairs and reduce the need for domestic connections in Tokyo. Of the 30 routes Innovata records between Japan and Europe, only 10 fly into a Japanese city other than Tokyo. Almost all of those 10 routes are outside the ranking of the 15 largest routes between Europe and Japan. Finnair's routes to Nagoya and Osaka Kansai are served daily, as are Lufthansa's. While airlines have not focussed on Japanese cities other than Tokyo, KLM broke the trend with a three-weekly Amsterdam-Fukuoka service, introduced only in Oct-2012. That route is part of the AF-KLM Group's strategy of targeting secondary cities in Asia. The two do not have a joint venture in Japan owing to the lack of another long-haul Japanese carrier, but they have an impressive 20% market share despite the lack of feed. 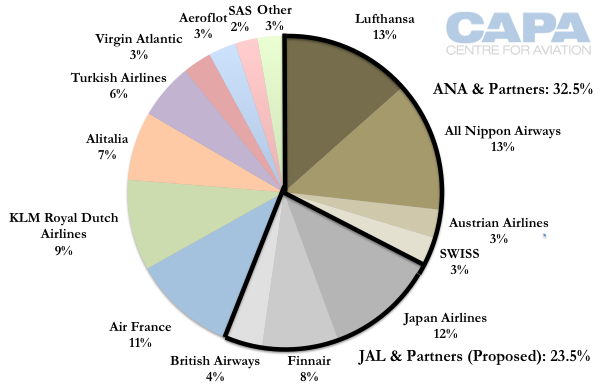 Prior to Finnair's addition to the BA-JAL JV, AF-KLM had a greater share of the Europe-Japan market. JAL in Jul-2013 launched daily Tokyo Narita-Helsinki service on its 787. The route had been announced in early 2012 for launch in 2013 but was delayed with the 787's grounding. 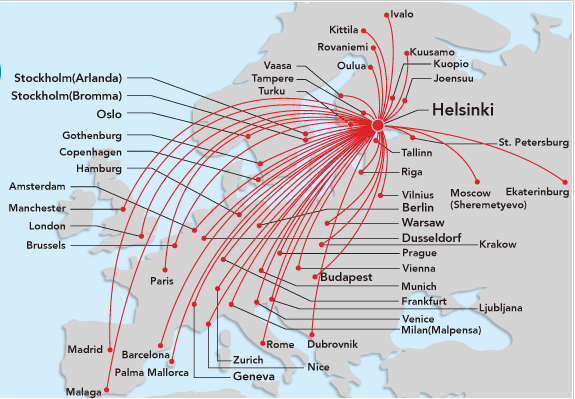 The route aims to increase JAL's connecting opportunities in Europe, with sample itineraries indicating the efficient nature of Helsinki as a hub. Shortly after JAL announced its Helsinki route it became apparent there were warm feelings at both JAL and Finnair about cooperating in Helsinki. Bringing Finnair into the BA-JAL JV brings benefits with few drawbacks. In Jul-2013 Finnair entered the trans-Atlantic joint venture with American Airlines, British Airways and Iberia. While there was familiarity with Finnair, there was also respect from the side of International Airlines Group, owner of British Airways and Iberia, for Finnair's strategy and maximising its geographical asset. At CAPA's Airlines in Transition forum in Dublin in Apr-2013 IAG CEO Willie Walsh commented on the strength of Finnair's strategy, and joked that he has the moving map turned off BA's Asia flights as otherwise passengers would see they are overflying Helsinki exactly and next time would take Finnair, not BA. It may be early days, but IAG and Finnair are moving along a complementary path. Finnair is considerably smaller but with geography on its side for Asia, which BA lacks – as well as growth opportunities at Heathrow. BA is the only IAG brand in Asia, making it a smaller player in Europe-Asia traffic. BA is meanwhile turning its attention to China, opening a London-Chengdu service, its first into a secondary Chinese city and the first of what will likely be a few more Chinese cities to come this decade. Finnair has launched in the secondary cities of Chongqing and Xi'an. Even if the two continue their growth, there will be more Chinese candidate cities than equipment or slots to serve them. Alliances are a delicate matter in China, and BA and Finnair will not be helped by their lack of a oneworld member Chinese carrier to advocate for them to the government. The growth and partnership story is still young and changing, but BA and Finnair are increasingly finding themselves on a similar page. No doubt the Japan JV will further the relationship, and perhaps point the future direction. New flights could emerge from the oneworld or Star JVs, but they are more likely to come from ANA or JAL, which are increasing their international focus as they see low-cost carriers and lower cost full-service airlines starting to occupy the short-haul space. JAL's Helsinki route joins a number of new routes ANA and JAL have opened in recent times, including Boston, San Diego and San Jose. And there is more to come: JAL in 2012 projected its international ASKs to grow 25% in FY2016 compared to 2011 while domestic would shrink 3%. And waiting in the wings is the even more revolutionary thought from ANA to purchase a foreign airline to also increase its international exposure. As the Japanese carriers venture increasingly along this route and as the contact points between them and their European partners increase, so the potential for greater cooperation spreads like ripples on a pond. The immunised, closed, JVs offer some special opportunities for the respective airlines; although it is still fairly early days for these partnerships, they hold considerable promise. And, for BA-Finnair, this new step along that direction would appear to put behind them their differences over Qatar Airways joining the oneworld alliance, which Finnair had previously opposed, fearing dilution of its Asia-Europe connecting role. A strengthened partnership between them will both be a positive development for the two carriers, it should also help BA to move along in using the oneworld links with Qatar Airways to offset the now-significant power of Emirates and Etihad on the southern routes from Asia to Europe.